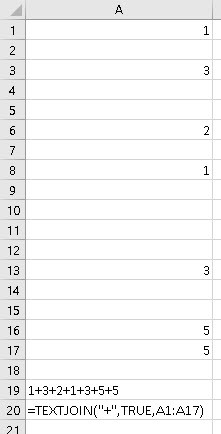 I have numbers in a column like you see below … a number … one or more blank rows … a number … one or more blank rows … a number … and I want to combine all of those numbers in that column to look like this, eg, 1+2+3+4+5 … how can I do that? Use TEXTJOIN in A19 with the ignore_empty option set to TRUE and there you are. The delimiter does not have to be + … it’s in “” so you can put whatever you like! The range of values can be as big as you like. There you are, no file to download because you can recreate this so simply by yourself.